Could You be a Successful Acton Market Trader? This Saturday there will be a market on the Mount in front of Morrisons which is to be the first of many. Are you are interested in a new career as a market trader? Action Acton are encouraging local people to start new businesses at the new weekly market by running a free specialist Market Traders Training Scheme. The training scheme is for anyone over 16 and will cover everything from the first steps to market trading to managing money, doing market research and expanding the business. Thirty people have already been on the training sessions, the first held in November 2006. Brenda Bertin attended the first introduction taster session and got the bug. 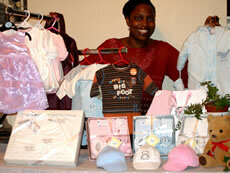 She continued with the training and had her stall, called Belmont, selling baby and toddler clothing and accessories.